Welcome to the Charlotte IAHSP® Regional Chapter! 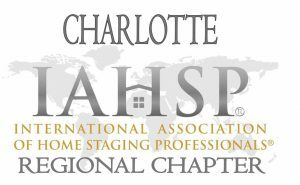 The Charlotte IAHSP® Regional Chapter was founded to provide a business association for professional Stagers throughout Charlotte. Our goal is to foster growth, unity, and awareness among each other and within the Staging Community. Through our efforts we hope to educate our community about the benefits of Home Staging and to demonstrate our commitment to the industry through the quality of our services. Any Home Staging Professional who has earned one of the educational credentials found on the IAHSP International home page is eligible for membership. You must be a member of IAHSP International to join an IAHSP Regional Chapter. For information on meeting dates and our meeting location, please click on our ABOUT link and the CALENDAR link on the top. To attend our meeting(s), please contact the Membership Chairperson or the Chapter President and we will add you to our invitation list. Prospective Chapter Members are allowed to attend up to 2 meetings for free before being asked to officially join our chapter. For information on IAHSP Charlotte Business Affiliates, please click on our BUSINESS AFFILIATES INFORMATION link on the top. These Affiliates are treasured in our industry for their commitment to their service and community. We encourage our Members and our community to work alongside these great vendors. For information on how to join our Chapter as either a Member or an Affiliate, please click on the JOIN link at the top of the page or the button below. To help share our mission and to help us continually expand our Chapter in size and services, our Chapter also accepts Remote Members. Remote Members are all Members and Affiliates who are out of our local area.